Euro Palace, a licensed and regulated casino that gives top priority to responsible gambling, enjoys a great deal of popularity because it does everything in its power to give players a superior Internet gaming experience. The casino website has a stylish, elegant, but easy to navigate design that makes it attractive to a large number of players. A brand belonging to Digimedia Limited and licensed in Malta, the online casino belongs to the Fortune Lounge Group. Since the online casino bears the eCOGRA seal of approval, it is one of the safest and most trustworthy online casinos to gamble at. Euro Palace Casino provides a completely different layout when first entering the casino. Unlike many other online casinos, Euro Palace has decided to provide a neat look for their gaming platform. When you first open the casino, you are presented with a European Palace in the background along with various information about the casino. This includes their amazing come bonus and current accumulated jackpot value in the center of the screen. At the top, new players have the opportunity to select a different language, including English, Dutch, French, Spanish, Portuguese, Italian, and much more. The top right corner also includes the option to log in for current members. Scrolling down on the home page gives you a look at their latest game releases, which is followed by more info about the casino and what they offer. On all pages, a small green bubble appears, giving visitors and members the option to get into contact with the casino via live chat. Next to the login option, visitors and press on the menu button that pops up a menu that includes various options to choose from. The first time you open the menu, it might seem somewhat overwhelming, but actually, this includes various options that allow you to gain access directly to the place you desire. Not only does this make it easy, but also very fast when looking for info on the casino, specific games, bonuses, and much more. However, clicking on any one of the options within the menu takes to a page offering only those options. This means to access other games; you would once again need to click on the menu button and find the titles you desire. This results in a whole new page loading, which takes a big longer than sites that use a filtering system that appears at the bottom of the screen, which might be difficult to spot at first. On each game, a heart logo appears that can be pressed so that the game is added to your favorites. This can be accessed in your account, making it easy to find the games you play the most. Euro Palace Casino welcomes its newly registered players with a warm welcome bonus of up to $500, absolutely free. To claim their new player bonus, players need to register a real money player account and make a deposit. The online casino will then reward a 100% match bonus up to $150. As soon as players make their second deposit, a second bonus of 50% up to $350 will be added. Euro Palace also runs a number of weekly and monthly promotions, which include slot tournaments, match bonuses, and lucky draws. Players can grab no end of cash and non-cash prizes, along with special deposit bonuses, cashback offers, and others at the online casino. The online casino also rewards loyalty in a generous manner. Whenever players wager real money on the casino games, they will get Reward Points. As soon as players collect 5,000 Reward Points, they can exchange them for real money. Euro Palace also offers a VIP Club that can be accessed on invitation only. VIP members will be pampered with exciting giveaways and a dedicated support agent. Euro Palace belongs to the Fortune Lounge Casino Group, which has become known to offer only Microgaming software. For some of you, this might be a disadvantage whereas other will know the Microgaming selection is one of the biggest in the world and new games are added on a regular basis. The developer features all types of casino games, giving members of their casino the ability to enjoy anything from classic slots to live dealer table games. Euro Palace has a fantastic variety of slot games with over 321 slot game titles. You will be able to enjoy 2 arcade slots, 78 reel slots, 1 AWP slot and 240 different video slots. The slot games include Jungle Jim: El Dorado, Ninja Magic, Pretty Kitty, Lost Vegas, Wild Orient, SunTide and Bikini Party to mention a few. If you enjoy your table games more than slots, you are in for a real treat as Euro Palace has a wide range of different table games. There are 27 variants of Blackjack, 7 different poker variants, 8 roulette variants and 3 Baccarat variants. You can also indulge in over 24 different video poker games including Jacks or Better, Louisiana Double, Tens or Better, Aces & Eights, Aces & Faces, Deuces & Joker, Bonus Poker Deluxe, Deuces Wild Multi-hand and Joker Poker Multi-hand amongst others. Euro Palace also offers an incredible collection of progressive jackpot slots to make you an instant millionaire. The progressive jackpot slots include Mega Moolah, Tunzamunni, Lots A Loot, Fruit Fiesta, Treasure Nile, King Cashalot, Major Millions and many more. Furthermore, Euro Palace has 14 different scratch card games including Dawn of the Bread, Game Set and Scratch, Granny Prix, Card Climber and others. If that’s still not enough to keep you playing all day, you can also go crazy with their selection of casual games including Monkey Keno, Six Shooter Looter Gold, Four by Four and Triangulation. Euro Palace can be accessed from your mobile device to open a brand-new world of online gaming. You will be able to enjoy the casino through your mobile device without the need to download any software as you will play directly from the web browser. You will also be pleased to know that both Mac and Windows-enabled devices are supported at Euro Palace. Euro Palace mobile is compatible with a range of different devices including iPhone, Blackberry, and Android mobile phones as well as iPad, Blackberry Playbook, Galaxy Tab, Sony and Asus transformer tablets. Euro Palace online casino is a member of the award-winning Fortune Lounge group. Although Euro Palace itself might not have received any awards since their inception, the casino does form part of the Fortune Lounge group that received several different awards including the Top Casino Group award in 2005. Euro Palace can be played on your desktop, laptop, smartphone or tablet from anywhere in the world. However, there are a few countries that will not be able to sign up with Euro Palace due to the strict regulations for certain countries. The restricted countries include Wallis and Futuna, United States, United Kingdom, Turkey, U.S Minor Outlying Islands, Israel, Spain, Afghanistan, South Africa, Iran, Sant Pierre and Miquelon, Iraq, Saint Martin, American Samoa, Saint Bartheley, Belgium, Reunion, Denmark, Palau, France, Metropolitan France, French Guiana, Mayotte and Italy. Euro Palace has an excellent customer support system, which includes support through email, live chat, Skype, iMessage, Whatsapp, and telephone. Players can use an online contact form or get quick telephonic service in multiple languages such as English, Finnish, German, Portuguese, Swedish, Greek, and French. Euro Palace will also get back to you within 24 hours if you contact them via email and their live chat facility is available around the clock for your convenience. Euro Palace stands out from the competition with the extraordinary advantages that come with playing at their online casino. 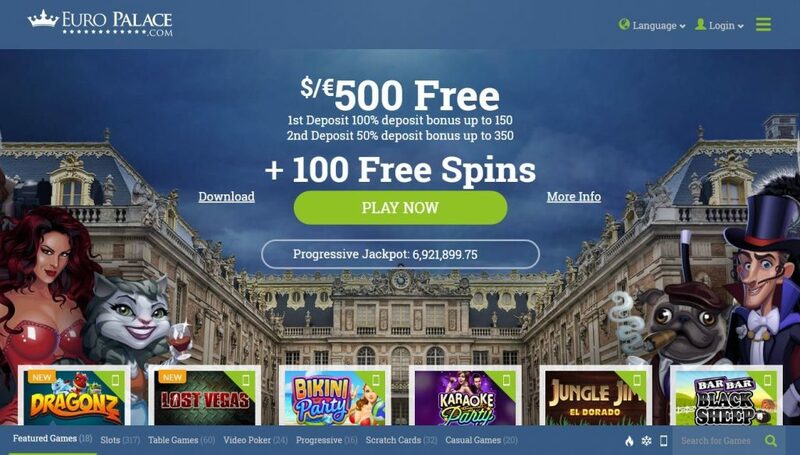 The advantages begin with a no deposit welcome bonus to test your luck at a variety of different games before you decide to make your first deposit. The online casino also features over 300 games titles to ensure you are pampered from the moment you sign-in to your casino account. Furthermore, the customer support section of the casino provides support in multiple languages, so it really doesn’t matter where you playfrom, there will always be someone to assist you with your queries. The only disadvantage to such a magnificent casino is the fact that they don’t accept any U.S registrations.